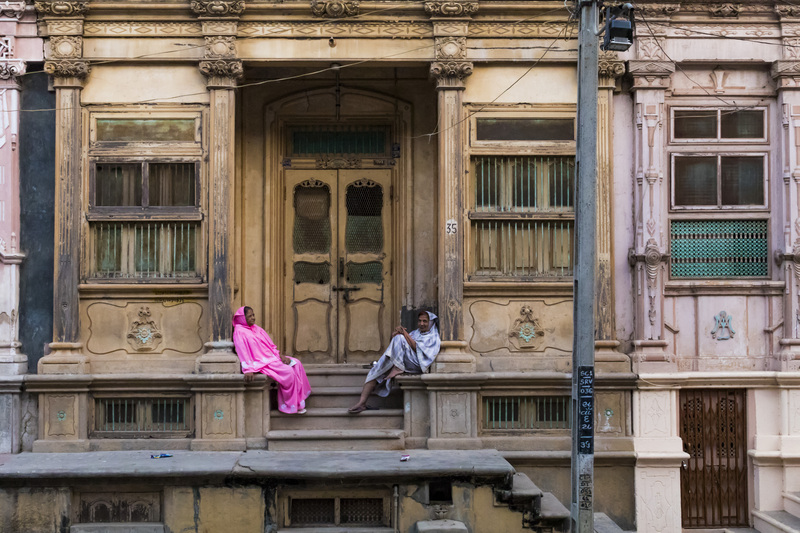 The story of the “Dawoodi Bohras” of Sidhpur is almost as old as that of the town itself. 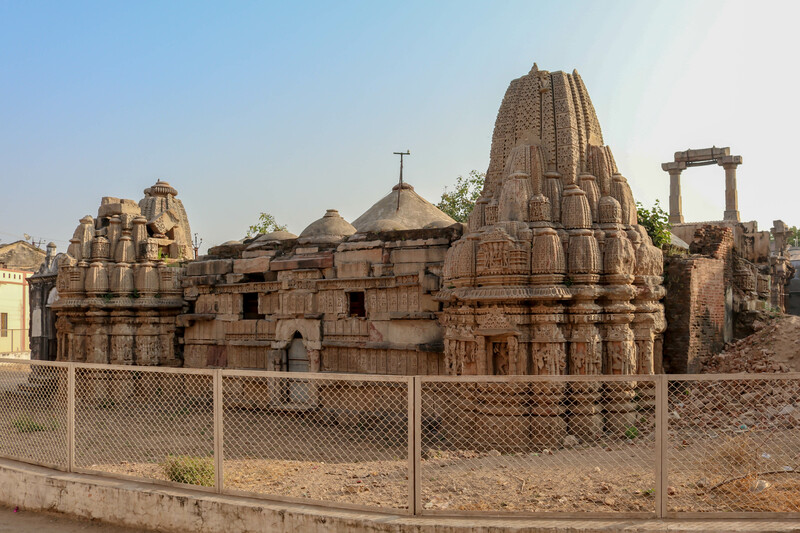 It goes back to about the time a tiny hamlet on the western banks of the Saraswati River came under the patronage of the Rajput Suryavanshi King Siddharaja Jaisimha Solanki, nearly a thousand years ago. Contemporaneously, while the Rudra Mahaliya was getting its finishing touches at Sristhalaka (later Sidhpur), from far away from Cairo, a missionary was on its way to Gujarat. This small contingent, sent by the 18th Fatimid Caliph-Imam Mustansir Billah (r.427-487 Hijri/ 1036-94 AD), established a foothold at Khambat. In a subsequent mission, individual members spread out in different directions. According to Dawoodi Bohra historical sources, one of them (himself a convert), reached the court of King Siddharaja at Anahillavada (modern Patan) and, over a period of time, convinced the two wazirs, brothers, Raja Tarmal and Raja Bharmal, to convert to their mission’s Shi’a faith. Having planted this seed, the Community’s egalitarian philosophy brought in more converts, especially from high caste Hindu Brahmins. Evidence of this can be seen in the continued retention of Hindu surnames by many Dawoodi Bohra families. The converts continued many of the rituals and practices, especially those connected to weddings and childbirth, for several hundred years and these have either been given up recently or have morphed into new rituals. The most notable one being that of “Aarti”. It is often wrongly claimed that the early missionaries adopted violent methods for conversion. Given their minuscule numbers and the meagre resources at their disposal, this is highly unthinkable and unlikely. The misconception has largely arisen from the actions of various later Muslim monarchs, sultans and governors who succeeded each other from the 13th century onwards, and who proselytised the masses to their Sunni faith. In fact, in the annals of their history, the Tayyibi Mustali Community suffered as severely, and even more, at the hands of these bigots, as the rest of the population. Under the Muffazarids in the second half of the 15th century, their numbers actually reduced considerably due to forced conversion from being Shias to become Sunnis. One of the prime reasons why the Tayyibi Mustali Community thrived in Gujarat was because they successfully filled up commercial lacunae of supply of goods and services. Very soon they became merchants, traders and service providers in various economic activities. Their family names came to be associated with their diverse businesses;2 but more importantly their God-fearing nature and honest dealings earned for them the permanent appellation of “Vohra”. (Honest dealings in Gujarati), that with constant usage, got anglicised into “Bohra”. In 1591 AD (999 Hijri), during the reign of Mughal emperor Akbar, there was a split in the community over the dispute of succession, into two rival branches – Daudis and Sulaimanis. Each community adopted its respective breakaway name. Although both have a significant presence in Sidhpur, the former outnumber the latter by a long way. Today, this is the lineage that the worldwide diaspora of the Dawoodi (Daudi) Bohras trace. 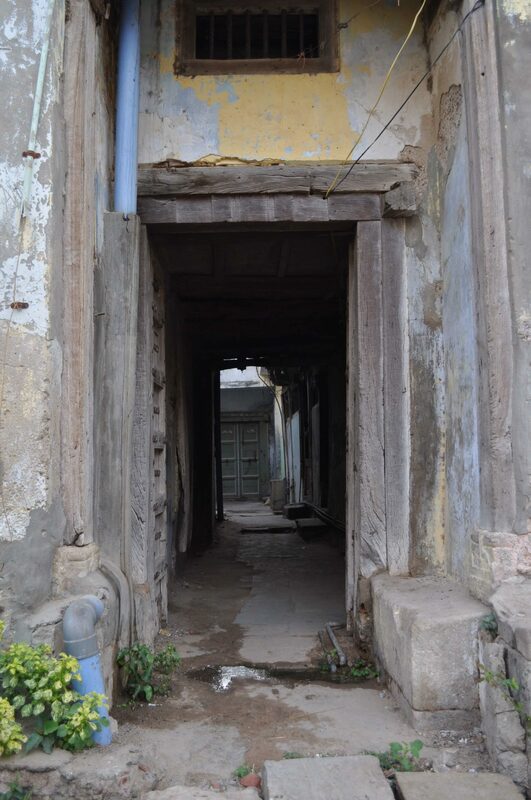 The oldest Dawoodi Bohra residential enclave in Sidhpur is Hassanpur, adjacent to the Rudra Mahaliya complex. Old-timers still fondly think of the area as “Gaam” (village). For over 600 years, not much is known about the profile or activities of the community, except that they were shopkeepers and petty merchants, whose lifestyle, apart from their religious practices, did not vary much from those of other communities. In the absence of documented records, any narration about this past can only be speculative. But a fair degree of conjecture is possible based on the layout of Hassanpura itself. 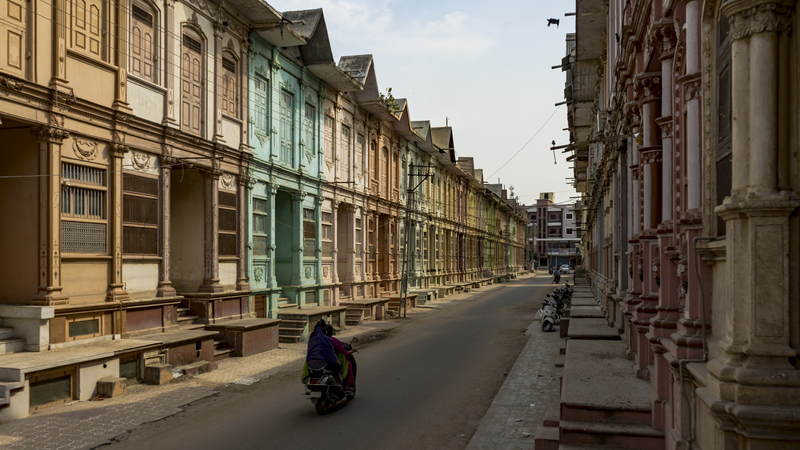 In a pattern, common across eastern Gujarat, the residential layout is characterised by a profusion of narrow, squiggly alleys without any exit; locally called Pols. These could be locked at night, and are pointers to three important aspects of daily life – *need for security against unexpected intruders and trespassers; *a constant and fierce need to protect female privacy and *a vernacular response to extremes of climate. Self-policing was everybody’s concern. With large joint families all under one roof and a shortage of space indoors, public space became the main venues for conducting family functions. Hence, Community involvement in each other’s affairs became an acceptable and routine practice. It extended out to embrace other communities as well. This sedate lifestyle was constantly interrupted and put at risk by life-threatening events like famines caused by monsoon failures, earthquakes the regular toppling of one dynasty by another and religious persecutions. – Cheek by jowl with a temple dedicated to Lord Shiva; and on the banks of the sacred Saraswati River, with which it shares no physical or sentimental links, how did the Dawoodi Bohra Community come to be here? – Deep in the heart of Hassanpura, how did a Hanuman Mandir come to share a common wall with a Shi’a masjid? Which came first? – Were the Tayyibi Mustalis the area’s occupants from the very start? Or was the area occupied by high caste Brahmins who later converted? If so, when did this happen? The first migratory movement- to other parts of the country and to foreign lands – came about in 1813, as a consequence of a severe famine that plagued large parts of Saurashtra. This calamity, in fact, changed the community’s mindset and occupational patterns and gave them a wider worldview. Growing affluence brought drastic changes in lifestyles. In most families, at any given time of the year, there would be only one adult male in the house, along with female members, children and the elderly. The rest of the working males would be away managing the family business in some distant place, waiting for their turn to come home. Intercommunity bonds became even stronger in view of the extra protective role that others were often called upon to play. The system worked well. In a fresh burst, this migratory trickle picked up momentum when Sidhpur got linked on the Rajputana Malwa Railway network in 1879. Within a decade, the Dawoodi Bohras spread to Abyssinia (now Ethiopia), Zanzibar, Madagascar, Aden, Egypt, Ceylon (now Sri Lanka), Burma (now Myanmar), Singapore, Siam (now Thailand), China and a few more. Predictably this outflow was more than matched by a greater inflow from neighbouring towns and villages. Families began giving up their undependable pastoral pursuits to chase an economic dream with higher benefits and better prospects. As housing demand increased, the affluent families moved out of Hassanpura into a more swanky layout at Harariya. Their growing wealth became clearly visible in their street layout and in their architecture. The wider perspective and the general security environment ensured by the British sent the old system of pols into oblivion. In a small town, with a population of barely a few thousand, and with the Dawoodi Bohras themselves constituting a very small percentage of it, it must have taken them a rare piece of daredevilry to break the timeless ritual of moving beyond “kalapani” after nightfall. The taboo of crossing any water body and appeasing it was overcome by offering it a coconut or a betel nut (supari). If either of these were not available, then a symbolic coin served just as well. Out of this practice, the community developed its own ritual of seeing off their loved ones going on long journeys with a token amount called “Vidai”. The Dawoodi Bohra religious leadership were the vanguards who catalysed this progress. Their clarion call, to spread wings, was taken up by many enterprising families; most of whose deeds, unfortunately, have not been recorded by their progeny; one of the exception being the Hararwala family. In 1885 one particular group of friends took over a Jewish company – Ms Menahen Messa based in Aden. Very soon they expanded their business to Egypt, Abyssinia and Somaliland. When an offer of the partnership came from Mr Ras Makonen, the then governor of Harar (a town in Abyssinia), they jumped on it with alacrity. This gave them unlimited access both to the ruling monarch King Gabriel Haile Selassie and to large parts of Abyssinia. According to family sources, the company’s fortunes suffered a double blow with the Italian invasion of that country by the fascist Mussolini in 1935, and by the inability of the succeeding partners to carry the business forward or even to maintain it on an even keel. 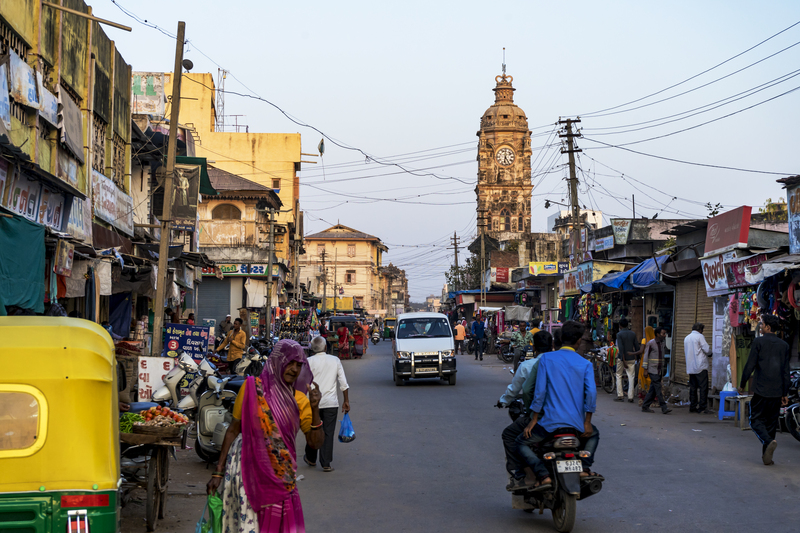 Some of the classy buildings (including the clock tower) in Sidhpur were built by members of this group. Then for the third time, the community was catapulted to greater heights – this time by a natural calamity of very grave magnitude. The Chappaniyo Dukaal (famine of ‘56) at the start of the 20th century saw their philanthropy being rewarded by the ruler of the region, Siyajirao Gaekwad. To meet their growing housing demand, they asked for and were allotted a huge tract of land, closer to the railway station, with the condition that it be developed along European Town planning norms. Thus the stage was set for the creation of a unique architecture style where the owners brought in ideas and wealth from foreign lands and the local craftsmen adapted them to their individual needs. Over a period of 50 years, the Dawoodi Bohras put on a stunning display of architecture and interior design show. Styles like Neo-Classical, Italian Renaissance, Art Deco and even bits of east Asian elements were introduced in the facades of their buildings. 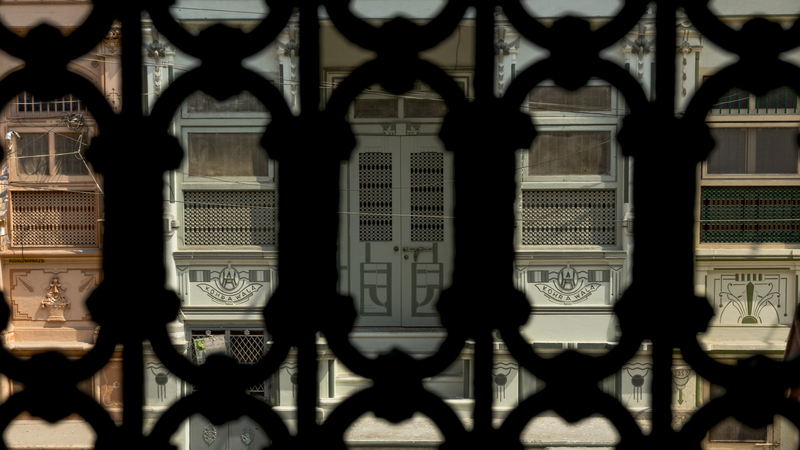 But even more commendable, most of these features were brilliantly converted to an indigenous style that has continued to remain the iconic image of a typical Bohra house of Sidhpur. In a wonderful display of “payback”, the affluent families created a self-sustaining infrastructure of all amenities; such that neither the Community nor the town was lacking in anything. Schools, library, clinic, maternity home, guest house, orphanage, college, recreation areas and even agro-industries all came up in quick succession. The community was actively involved in the welfare of the town. With Indian independence and the departure of the British and due to various extraneous factors, this enthusiasm first slackened and eventually faded away. After independence, the Dawoodi Bohras were once again seized by a final surge for migration. This time entire families began moving out along with the working members, to their place of business. Within a decade the once vibrant mohallas fell silent; Houses were locked up; Neighbourly and inter-community connections became weak and fragile. With the passage of time, these were often misconstrued as interference. Unlike as in the past, this time there was no exodus from the surrounding regions. As one generation passed away, the demographic profile of the community changed sharply. With a large percentage of the dependent population an apathy set in. Internal initiatives gave way to external decision making. Generation Next must be induced to focus some of their energies on rejuvenating the town. There is a vital need to infuse new blood. An already huge capital is available at their disposal – their unique architectural heritage. Both the Government authorities and the various stakeholders need to come on to a common platform to exploit and prolong this legacy for as long as they can. Please give some reference of the narration being discussed here.